Here's a list of special Easter events for kids, like egg hunts and photos with the Easter Bunny, leading up to and including Easter Sunday, April 21, 2019. When: Thursday, April 18, 2019, from 10:30 a.m. to 12:00 p.m. for kids 8 and under. Pictures with Easter Bunny start at 10:30 a.m. The hunt begins at 11:00 a.m. Bring your own basket. When: Thursday, April 18, 2019, 10:30 a.m. – 12:00 p.m. Pictures with Easter Bunny at 10:30 a.m. Easter Egg Hunt for kids 8 and under begins at 11:00 a.m. Bring your own basket! The St. Johns County Parks Department partners with First Coast YMCA for this Easter event, where children ages 5 to 12 years can gather eggs left underwater and trade them for prizes at the Bunny Store. Participants should bring swimsuits, towels, and buck for their eggs. Please RSVP to this email or call (904) 704-4644. When: Thursday, April 18, from 6:30 to 7:00 p.m.
Where: The Solomon Calhoun Community Center and Pool is located at 1300 Duval St. in St. Augustine. When: Saturday, April 20, 2019, 10:30 a.m. – 12:00 p.m. Pictures with Easter Bunny at 10:30 a.m. Easter Egg Hunt for kids 8 and under begins at 11:00 a.m. Bring your own basket! Where: 1595 Wildwood Drive in St. Augustine, FL 32086. (904) 209-0346. When: Saturday, April 20, 2019, 10:30 a.m. – 12:00 p.m. Pictures with Easter Bunny at 10:30 a.m.; Easter Egg Hunt for kids 8 and under begins at 11:00 a.m. Bring your own basket! When: Saturday, April 20, 2019 at 10:30 a.m. The Easter Bunny will be on site for photos. Egg Hunt for children 11 and younger and free brunch buffet for the entire family. Event begins at 10:30 a.m.
Where: Shores United Methodist Church is located at 724 Shores Boulevard in St. Augustine, FL 32086. (904) 797-4416. There will be egg hunts for all age groups, as well as bounce houses and snacks and a special prize for finding the Golden Egg. When: Saturday, April 20, 2019, from 2:00 to 3:30 p.m. The Toddler Egg Hunt (walkers to 2 years) is at 2:35 p.m., the Preschool Egg Hunt (3 years thru 5 years) is at 2:50 p.m., and the Elementary Egg Hunt (K thru 5th grade) will begin at 3:10 p.m. When: Sunday, April 21, 2019. Easter egg hunt for kids as well as activities for adults. Event begins after 9:00 a.m. mass. Admission: Brunch and Easter egg hunt are $72.00 for adults and $30.00 for children ages 6 to 12. When: Sunday, April 21, 2019, from 10:00 a.m. to 3:00 p.m. Two Easter egg hunts will be held, at noon and at 2:00 p.m. Call (904) 273-3238 for reservations. Where: TPC Sawgrass is located at 110 Championship Way in Ponte Vedra Beach, FL 32082. 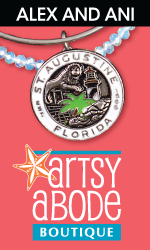 For more information about what's happening during Easter in St. Augustine, visit here.